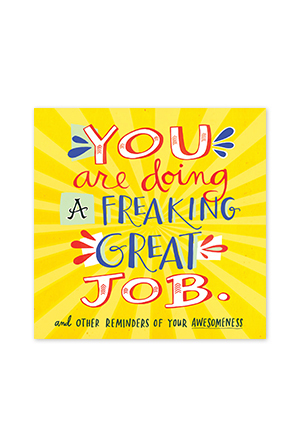 The perfect gift, and the easiest gift—because we all know someone who deserves a pat on the back, a big thumbs-up, or just a special thank-you! 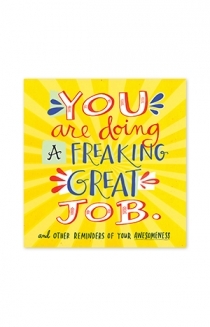 You Are Doing a Freaking Great Job is a vibrant, colorful, pocket-size book of encouragement. Created by more than 20 artists and designers—from the well-known Etsy favorites Emily McDowell and Mary Kate McDevitt, to emerging talents Lindsay Whitehead and J. Zachary Keenan—this powerful little book is filled with nearly 200 uplifting and inspiring quotes, lyrics, and words of advice rendered in the original hand-lettered style of art that is pinned and repinned on Pinterest and sold on Etsy. There are mantras: “You are in charge of your own happiness.” Galvanizing words of action: “Make it now.” Heartening quotes: “You are capable of more than you know.” Bursts of motivation: “Be a Warrior, Not a Worrier” and “Spread Your Arms and Trust Your Cape.” Interweaved throughout is complementary text—including surprising playlists, sweet and simple recipes, and suggestions for inspirational films to watch and commencement speeches to read.